There is an exquisite flow that occurs when I am painting and falling deep into the color as it coats the canvas. Suddenly, I remind myself that I need to take a step back, look at the big picture, and plan. I always look out for painters who seem to demonstrate this flow – especially with color. I was attracted to Helen Frankenthaler’s paintings because she appears to truly understand this concept. Helen Frankenthaler was a German-Jewish abstract painter, born in 1928 into a wealthy family in Manhattan, New York. Her father Alfred Frankenthaler, was a New York State Supreme Court Justice while her mother, Martha Lowenstein, emigrated with her family from Germany to the United States. Helen Frankenthaler grew up in New York’s Upper East Side and lived with a educated and progressive Jewish family. She studied art at the Dalton School and Bennington College. She was popular in the abstract art community through six decades. Her first major accomplishment was a showing at the Jewish Museum in 1960 in New York City. The Jewish Museum is especially meaningful to many Jewish people in the United States as it is the first museum in the United States to specifically showcase Jewish artists, in addition to one of the oldest existing Jewish museums in the world. She is now considered one of the most “important contributors to the history of postwar American painting,” according to the Jewish Women’s Archive. While she may have planned her paintings, it seems that her flow is uninterrupted and exploratory. She once said, “The only rule is that there are no rules. Anything is possible … It’s all about risks, deliberate risks.” Many painters are familiar with the initial steps of painting with oils. Personally, doing color studies is my favorite part of the process. A color study is a step in preparation for the final piece. The artist creates rough shapes in various colors in order to check that the colors don’t clash. In Frankenthaler’s paintings, it is easy for the viewer to fall into her color and thus, in a way, the viewer becomes the painter. This is because the viewer becomes aware of each step in the process. 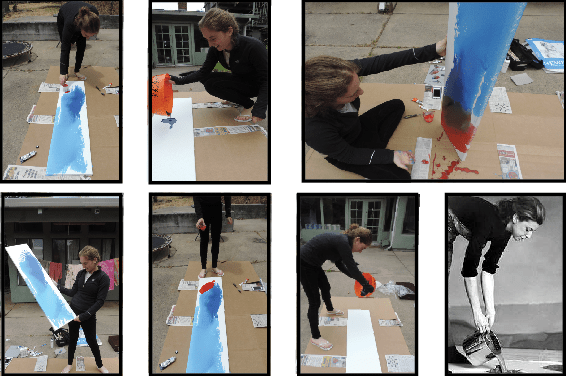 She explains, “The landscapes were in my arms as I did it.” The act of pouring paint is a unique interactive experience – both physically and emotionally. In my own piece, I have used the color field method, used by Helen Frankenthaler.